There are no comments for Red And Blue. Click here to post the first comment. I have a LIMITED EDITION ENHANCED GICLEE of this original painting available. INQUIRE IF INTERESTED. 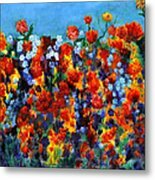 This is a giclee which has been reworked with transparent acrylic to bring back the impasto texture and full color palette of the original. 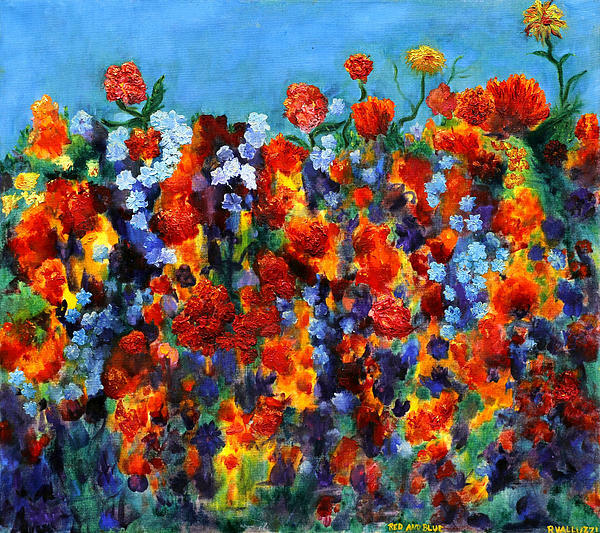 This is one of my "floral landscape" paintings, where a flower or plant motif is used to pattern the canvas and create a complex landscape of color. 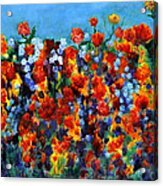 While the floral elements are there they are used to create the subject of the painting - an abstracted landscape - rather than being themselves the subject. Very wet washes of oil were used on unprimed canvas and built up in layers to create a vibrant almost watercolor effect. 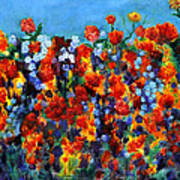 The details in the flower elements were then painted in using brush and pallete impasto techniques. The topmost layer of detail was applied using a knife and heavy gel medium, acting almost as an "applique".